This past summer we celebrated my daughter Hillary’s second birthday and one of my other children decided to make her a gift. The gift was to be a memory book complete with pictures printed off from the computer for each page. I encouraged my child to make this gift. I thought it was a lovely idea and I had no doubt that she could make it. I was busy in the house and did not stop to help, but she hurriedly set to work in an artistic, passionate flurry. She found the papers, retrieved the stapler, and within a few minutes she had created a book. She started labeling each page for specific memories of Hillary’s second year. It was precious. My daughter brought the book to me so I could see her progress. It was a little lopsided, but beautiful. I was proud of her work, but even more proud of her heart. As she started to flip through the pages I could tell immediately that one teeny detail was off and it was going to cause problems for the finishing of the book. I can’t even remember what it was, but when my daughter realized that she had made a mistake she was devastated. I took a deep breath. I knew that she had a few options…all with certain consequences. She could keep it as is. It wouldn’t be perfect, but did that matter? It would be just fine. She could take out the staples and try again with these specific pages. Again, it wouldn’t be perfect and signs of the mishap might still be evident, but again…did that matter? Lastly, she could start over. The book had taken her about 15-20 minutes to make thus far. It wouldn’t be a huge loss of time. It was very difficult, but I couldn’t make the decision for her. She was torn between wanting it to be perfect, which meant starting over and taking more time, and moving on, dealing with the imperfections. She wrestled with these prospects for a while. It was a really tough decision. She ended up starting over. She decided the imperfection of the gift bothered her more than investing the extra time. I watched all of this and didn’t particularly enjoy it, but I knew that it was this really great experience for her. A LEARNING experience, I think we call it. She was learning a lot, but one lesson in particular stood out to me. Sure, she was learning that it is important to be careful and take your time with a project. What is that old saying? “Haste makes waste”? Yes, that is all good. I am glad she was learning that. I still need to learn that lesson. She and I have sooooo much in common here. We both fling ourselves into things. We are ALL IN. ALL the time. And, sometimes there is haste that makes waste. So that saying up above hits a nerve with me. So, yes that is all fine and good and needed, but, what I was way more interested in here was another lesson that she…and I…need to learn. The courage to start again. I came across this scripture last week and I love it so much. So I went to the potter’s house, and sure enough, the potter was there, working away at his wheel. Whenever the pot the potter was working on turned out badly, as sometimes happens when you are working with clay, the potter would simply start over and use the same clay to make another pot. We don’t like starting over. Scripture seems to show us over and over that God doesn’t seem to mind, even if at times it is hard for Him to watch. He is, after all, the One who makes “all things new” (Revelation 21:5) and when we are in Him we are a NEW creation (2 Corinthians 5:17)…perhaps over and over and over again. Us? We don’t like it. Starting over is painful. It requires some very hard things. Starting over requires us to slow down. To surmise the situation. It requires a certain humility. 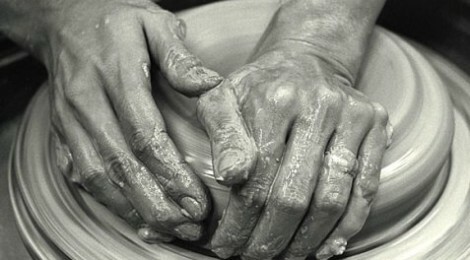 To be clay in His hands…to be continually made new…to be willing to start over…requires humility. Humility is a wonderful word that means neither shame nor pride in oneself. It simply means being honest about who you are…or, rather, WHOSE you are. Life is a continual journey with places where we stop and start again. I am praying for the courage, where and when needed, at any point on any task, big or small, to go slowly, to surmise the situation, to be honest…to be humble. Life…GOD…asks this starting over business of us over and over again. If we don’t respond we are in grave danger of getting stuck. We get stuck in the shame of what caused us to NEED to start over, looking back wistfully and painfully, and we are too full of pride to be honest and move forward. My grandmother tried to teach me to crochet when I was a little girl. The key word there is TRIED. I never could stick with it. Looking back I know why. It was so unbelievably difficult for me when she would point out a mistake and would ask me to unravel my work. She would explain that if I didn’t fix it now that in the end I would regret it. It was so devastating for me that I would just stop practicing and eventually stop asking for her help. I regret that. Perfectionism never gets us very far. Perfectionists often either don’t start in the first place because then they are never in danger of failing (or having to start again). Or, perfectionists quit before they have to face any threat of failure. Great word Emily! May we always have the courage to start again. Emily, I really appreciated your thoughts. Fear of failure- of not getting it right– can be incapacitating. I think The Lord has been helping me realize that what I always considered to be “responsible” and “conscientious” ( both good things) could be taken to the extreme where I felt it was all – or at least largely- on me. And I’d better not mess up!! That can result in paralysis!! Thanks for a good word that God is holy and perfect but doesn’t require perfection in us. And that He is always there with us as we begin again. Jane, thanks so much for reading and sharing your thoughts. I suspect so many of us struggle with this perfectionistic tendency of “paralysis of analysis”. He IS always there. So thankful. Great word! I needed this reminder on many levels. I am so thankful that even though we don’t live close to each other anymore I can still feel so connected to you through your honesty, sincerity, transparency, and consistent encouragement via your gift of writing. Miss you friend! So thankful for you. Tera, thanks so much for reading…and for writing! I miss you, too! Social media, blogs, etc, have a a lot of pros and cons, but I am so thankful for how it keeps me in touch with people I love. This has shed light to many areas of my life. There has been many times that I have felt the “paralysis”, and I am sure there will be many more times. I also am thankful for the reminder that He is always there, sometimes I forget that…sometimes I feel He is busy with someone else. Angela, yes…and more times…and that is ok. It is my hope that we get better at recognizing them so we can get out of that state sooner than the last time! I can relate to that idea of thinking He is busy with someone else. It is a crazy thought that He is always there, but He is! Thanks for reading and commenting, Angela! Very nice post. I have learned that change and beginning again is inevitable. I still don’t love it but I have learned to flow with it better and to anticipate with some joy rather than fear and dread, what the “new” will be.Sometimes “new” means better but always “new’ means learning and growth. Tobie, “sometimes new means better but always new means learning and growth”. I love this. Thank you for sharing from your very courageous heart, Tobie. This is so good! Thank you for this. Being made new over and over again. Amen and amen.